Save hundreds on the ingredients you use daily with Thrive. Sometimes, a website comes along that forever changes your life. Like Netflix, or Thrive Market. No doubt about it, Thrive Market has had a greater and more positive impact on my life than Netflix. Thrive Market provides 25 – 50% off your trusted health foods, wellness supplies, and supplements. Thrive Market gives you access to some of the world's best-selling natural and organic products at wholesale prices. I personally support Thrive Market because it's a business model that empowers consumers. How does the Thrive model work? Thrive Market is revolutionizing your relationship with your fork by offering natural foods for a fraction of the price of traditional health food grocers and delivered to your home for free. Additionally, their social mission of donating a membership to a low-income family for every paid membership makes healthy choices affordable for everyone. I collaborated with Thrive to create discounted bundles of my favorite ingredients. If you are new to a grain-free lifestyle or want to save significantly on healthy ingredients you love, check out these packages. Click here to sign up for Thrive market (no credit card needed — just enter your email). You’ll unlock access to my bundles as well as the other products on Thrive. Automatically get an additional 25% off your order (valid for savings up to $20) and free shipping. Is Thrive cheaper than Amazon? I’ve been purchasing ingredients at Thrive, rather than Amazon, because Thrive’s business model better meets my standards of integrity and sustainability. In addition, Thrive nearly always beats Amazon’s pricing, and quite significantly. Healthy Prices is website that compares the savings from Thrive and Amazon. Select or search for a product, and you’ll see that Thrive offers a much steeper discount. 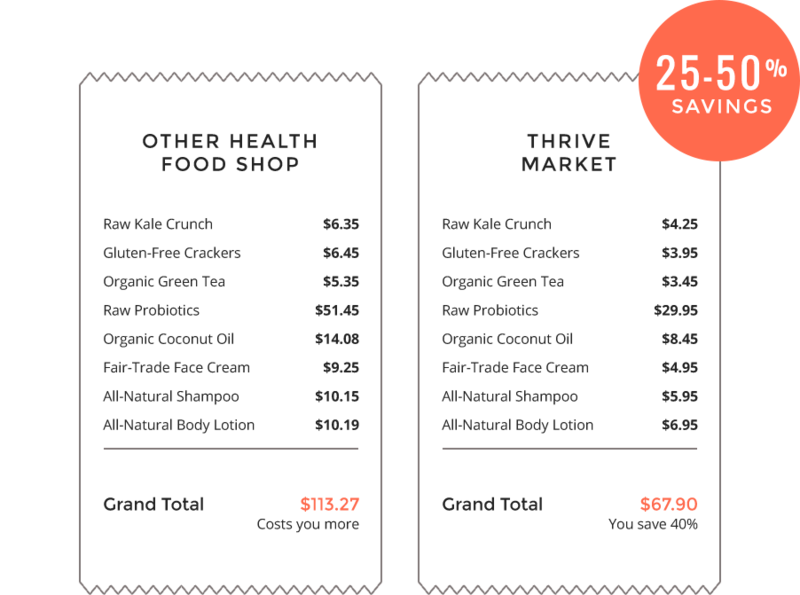 Click, “Add to calculator” to determine the cost of your order on Thrive. You’ll usually save 30-40% off your grocery bill.